Being among books is only half about actual reading, after all. The other part is talking about books with other people, a rich topic, and yet another is enjoying their presence. Just to be clear about the labels on this post: I'm not claiming Louise Erdrich for Canada, as much as I'd love to do so. But a somewhat large chunk of the book takes place this side of the border so I've added the tag. This was one of those serendipitous browsing things, though not in the sense of shelf grazing; more in the sense of I had looked up something in our library ebook catalogue and this popped up instead. I've always wanted to read Louise Erdrich (more so now) and I love the idea of the National Geographic Directions series, and ... well, I'm a little embarrassed to admit this: it was short. I wanted something short. Also, about books! So I downloaded this and here we are. A little ironic, as this book is at least partially about the love of books as physical objects. And rarely have I come across such a perfect defense of books as objects as the quote above. Hence, I'd love to have an actual physical copy of this. The condensed version: as with all books in the Directions series, this is an extremely accomplished author taking a trip that investigates something dear to her heart, and then writing about it. In Erdrich's case, she's gone to do a tour of the rock paintings on the islands of Lake of the Woods, taking along her 18-month-old daughter, and then to visit the historic island home of Ernest Oberholtzer and his immense collection of rare books. 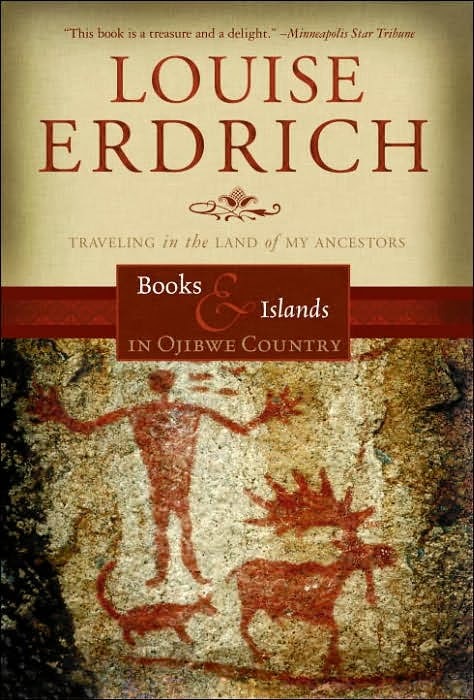 Throughout the book we get discussions of books and their very personal appeal and importance to Erdrich, briefer discussions of islands and their importance, and lots of discussion of the meaning of the rock paintings and Ojibwe culture and especially the language, and occasional digressions into mothering. I really loved this book. It's an important book, because of the notes on Ojibwe culture and language and because of the recognition that, in many ways, we're lucky either still exists -- she never harps on the role governments and the Catholic church (particularly the Canadian government) have played in the damage, but she doesn't shrink from pointing it out where necessary either. It's also a beautiful book, where it meditates on books and writing and language and the importance of all of these things, particularly to the author. And Louise Erdrich? Knows how to write. The chapter on the language, Ojibwemowin, is intense, and it is beautiful, and fascinating. Six thousand different tenses of single verb are possible. Imagine the books you could write in that language. Imagine the poems! English is a fine language, never going to knock it except maybe an affectionate jab here and there. But imagine how much more precise, how much more vivid, a language like Ojibwemowin must be. I also particularly enjoyed her description of Oberholtzer's island ("Ober's island") and its cabins and quirks of architecture, its library, the people and the food while she is staying there. Erdrich has an incredible grasp on descriptive language, and it shows to its best advantage here. I could visualize everything. And yet she is never purple in her prose, just perfectly eloquent. Makes for an absolutely delightful travel read. We have a lot of books in our house. They are our primary decorative motif -- books in piles on the coffee table, framed book covers, books sorted into stacks on every available surface, and of course books on shelves along most walls. Besides the visible books, there are the boxes waiting in the wings, the basement books, the garage books, the storage locker books. They are a sort of insulation, soundproofing some walls. They function as furniture, they prop up sagging fixtures and disguised by quilts function as tables. The quantity and types of books are fluid, arriving like hysterical cousins in overnight shipping envelopes only to languish near the overflowing mail bench. I want that house. I am working towards it. Yes, I work at a library. This is not enough. Used to be, I'd pack six preteen girls, two dogs (large Aussies), and myself in along with a week of food, clothes, games, and drawing materials, for a trip to a whole other island in Lake Superior were I did research while the girls swam, screamed, ate, screamed, roasted marshmallows, screamed, read "Wonder Woman" and "Catwoman" comics, slept, screamed, and woke, screaming happily, for a week or two. I don't really know how I have accomplished anything, ever. Lovely little book, well worth the time to find it and read it. Travel, culture, and lots of book talk. Highly recommended. I have this book near the top of my 'next-reads' pile -- now I am moving it up, it sounds as good as I thought it might be! Oh, I'm looking forward to seeing what you think! She really is quite a stunning writer. I am waffling about which fiction to start with. Oh, I should read more Erdrich! I admit it is hard for me to motivate myself to do so - the two books I read by her, Love Medicine and The Round House, were so, so sad. I LOVED The Round House but Love Medicine was just so raw and lonely, it was almost painful to read. Aarti, I will admit this has been my stumbling block with Erdrich's fiction. I don't need a lot of puppies and rainbows all the time, but I am a little frightened of reading a book as distressing as I know The Round House is going to be for me. I suspect it will be worth it, but I am frankly afraid. This, on the other hand, is a nice "safe" read -- serious, but not too sad, sometimes funny, and always totally fascinating.